The Thelemic Lesser Ritual of the Pentagram is the most enduring of all ritual methods for the preparation of the magician and place of working. To perform the Lesser Ritual of the Pentagram properly you will need to master the mudra of the Ankh or Tau-cross and the dual mudra of Horus the Enterer and Keeping Silence. Together, the three primary mudras are called the Cube of Space. The Rituals of the Pentagram are rarely used to actually ‘banish’ anything per se. 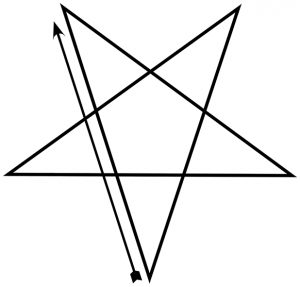 It is better to regard the two ways of drawing the pentagrams as firstly for invoking and opening, and secondly for closing or withdrawing. The primary use of the so-called banishing pentagrams is to return the psychic senses to the ordinary mode of consciousness. Both modes act as a defence for the magician, strengthening the astrosome and creating a balanced symbol through geometric extension. Our Lesser Ritual of the Pentagram is appropriate for the Aeon—the times we are now in. It is Gnostic, Thelemic, and utilises the Enochian language. Concerned over the use of the ‘averse’ pentagram (point downward)? Then read this article: Why is the Pentagram upside-down? Firstly, we need to understand how the Cube of Space is formulated in the Lesser Ritual of the Pentagram. We need to practice and understand the magical mudras or Godforms. We have restored these to their natural and ancient form, so you will find they differ in some respects from what is given elsewhere. For example, in Aleister Crowley’s Liber O, or in various publications presenting the historic rites and ceremonies of the Golden Dawn. Beginning the Lesser Ritual of the Pentagram: Stand up, with your head facing forward, and place the heel of your left foot against the middle of the instep of your right foot, forming a right-angle. Extend both arms at right angles to your body, so that you form a ‘T’ shape. The palms of your hands should be turned upwards. This mudra typifies and embodies the unity of heaven and earth, spirit and matter, the eternal and the temporal. It is the mark or sign of ‘Life’, encompassing all worlds and creatures. The circle of the heavens or space is the full range of consciousness. The cross defines a nexus between the eternal and the temporal worlds of space, time and matter. Use this mudra for stability, strength and endurance. Use it to acknowledge that the whole universe is a living, moving field of conscious intelligence, a continuum in which no creature or thing is truly separate. The Lesser Ritual of the Pentagram requires the technique known as the Assumption of the Godform. 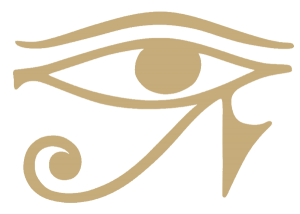 The mudra of Horus consists of Horus the Enterer and Keeping Silence. In all cases, with the one exception of the mudra of Typhon, the second mudra always follows the first. 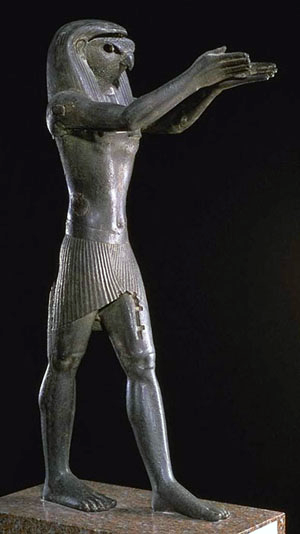 Horus the Enterer is sometimes called the Projecting Sign (see image of Horus above). Begin by standing with the heel of your left foot against the middle of the instep of your right foot, forming a right-angle. Your arms should be straight down by your sides. Inhale a full breath through both nostrils, at the same time bringing both hands up to the level of your ears, palms flat downward. While exhaling strongly, move your left foot a step forward, about twelve inches. At the same time extend both arms before you and turn the palms upward. The hands are brought together from the line of the little finger down to the edge of the palms, forming a ‘v’ shape, like an opened book. The fingers and thumbs are straight and pointing forward. The line of eyesight travels straight ahead, through the ‘v’ made with both hands. The three-fold projection of vital force, prana or radiation, streams from the fingers of both hands and the third eye. Imagine that you send out much force, in rays of light. Then recover the step, stand upright with your feet in the starting position, and press one finger to your lips in the mudra of Keeping Silence. Imagine the force condenses around you. The left foot is always used in the step forward, and the leg is kept quite straight though not tensed. The back is kept straight, the body is not “thrown forwards” and the arms are not “flung” as in the description given by Crowley in Liber O—it must be a balanced, graceful movement. The mudra we give here is identical to the way that the ancient Egyptians portrayed the god Horus. With this dual mudra the magician identifies with the Logos, issuing forth the primal utterance, streaming light from the void of night at the beginning and end of time. The mudra of Keeping Silence may be assumed astrally or imaginatively as a form of psychic defence. The god is usually seen as standing on—or exuding from—a lotus flower. In the case of psychic defence and protection the god is seen as standing on two crocodiles. The mudra of placing the finger to the mouth is to enclose and seal the circuits of force in the occult anatomy. The Lesser Ritual of the Pentagram requires the astral projection of Godforms. At the culmination of the ritual, four Neteru stand facing inwards when invoking and outwards (as Guardians) when banishing or closing: Ishtar, elemental deity of Air in the North; Babalon, elemental deity of Fire in the South; Ashtaroth, elemental deity of Earth in the East; Isa (or Isis), elemental deity of Water in the West. They may be imagined as winged, after the manner of Egyptian sarcophagus guardians, reflecting the qualities of their element. The Neteru that are seen standing in the quarters are best visualised as reflecting their respective element and station according to the magical correspondences. Thus elemental Air glows golden in the North, Fire flashes scarlet in the South, Earth shines emerald (or starlight on a night sky) in the East, and Water flows sapphire blue in the West. When invoking one should feel that the force and qualities of each element rush and pour into the circle and vivify the whole sphere of sensation of the magician. The elemental spirits—the sylphs, salamanders, gnomes and undines—are made much of in fantasy and fairy tale but the magician must know these are living forces of nature perfectly visible to the trained clairvoyant. The Neteru may be regarded as four faces of Shakti-Babalon, the feminine principle of divinity and power that manifests in nature. Each reflects and mediates her respective element and direction. The Neteru are most easily visualised in the Egyptian style, naked to the waist, with long diaphanous skirts, bracelets, anklets and other jewelled ornaments such as a beaded collar or necklace. They may be seen as having long wings that angle outwards and behind them rather like a bird’s plumage. If it is wished to create more detail then the astrological or Kerubic emblems may be incorporated. In this case, Ishtar would stand upon her own feet in the North, with wings. Babalon would be seated upon a lion in the South, Ashtaroth would be seated on a Bull in the East, and Isa would be seated upon an Eagle in the West—rising in clouds of mist above the surging waves of the sea. By names and images are all powers awakened and reawakened. If it is not possible to vibrate the words loudly and physically then a technique called the Great Voice is used. Imagine that the name or word roars forth to infinity while feeling it strongly resonating within. 0. Stand in the centre facing the North. Assume the Ankh or Tau-cross mudra. 1. Mark the Cube of Space: Raise your hands to your brow in a wide sweep, pressing them together as in a gesture of prayer. Lift your head slightly and raise your eyes upward to heaven. Send the power of your aspiration upwards. Vibrate as you do so: IAO! 2. Now lower both hands to your heart, while lowering your head and eyes to face forward again. Clench both hands together. Vibrate: SABAO! Send a current of force downwards to the centre of the earth. 3. With your hands still clenched at your breast, imaginatively raise the serpent or khuti to your brow, in silence. 4. Make the mudra called Horus the Enterer, sending a full exhalation of breath through both nostrils. 5. Recover the step, in the mudra of Keeping Silence. 6. Take up your wand and inscribe the pentagram in bright fire towards the North. Draw the point to the centre of the star. Vibrate: HO-LO-KO! 7. Spin about widdershins till you face the East, and create the pentagram as before. Vibrate: BI-KA-EL! 8. Spin about widdershins till you face the South and make the pentagram. Vibrate: IA MAL-PERAY-JI! 9. Spin about widdershins till you face the West and make the pentagram. Vibrate: BELIOR! 10. Spin about widdershins to face the North again. 11. Stand in the mudra of the Ankh or Tau-cross and say: Before me, ISHTAR, behind me, BABALON, on my right hand, ASHTAROTH, on my left hand, ISA! For about me flame the pentagrams, and in the column the six-rayed star. 12. Repeat the Cube of Space, steps 0–5. The four stars are seen flaming in the quarters when assuming the Tau cross. 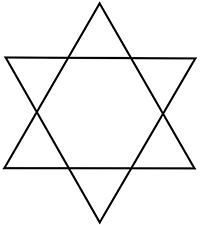 The hexagram appears above you and below you, as though it were engraved upon the ceiling and the floor, the heavens and the earth. In making the mudra of Horus the Enterer to the North, send forth the whole current generated by the ritual. 1. Hermetic Order of the Golden Dawn. Subscribe to our monthly Journal, The 93 Current.